German Alexander Zverev rose one spot to a career-high seventh in the ATP rankings released on Monday following his victory at the Rogers Cup in Montreal. 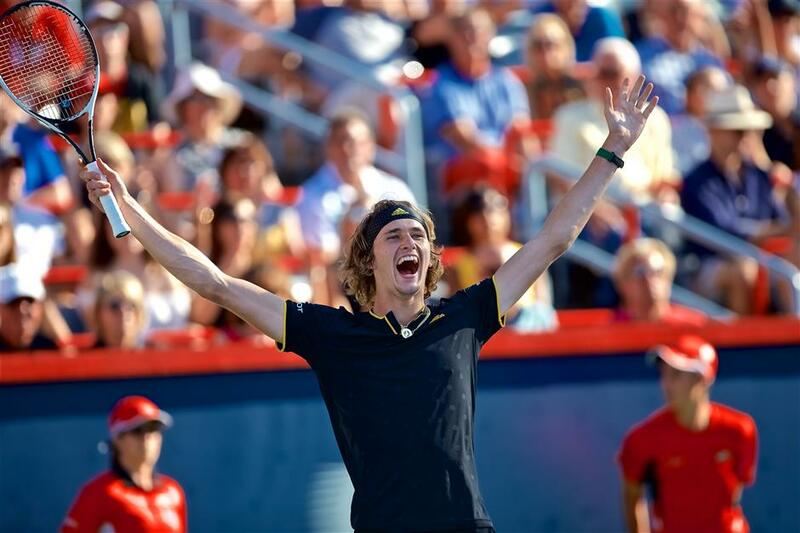 Alexander Zverev of Germany celebrates his 6-3, 6-4 victory over Roger Federer of Switzerland in the ATP Rogers Cup final at Uniprix Stadium in Montreal, Quebec, in Canada on August 13, 2017. The 20-year-old stunned Swiss great Roger Federer 6-3, 6-4 in Sunday's final to win his second Masters 1000 title of the year, having beaten Novak Djokovic in the Rome title clash in May. The biggest mover, though, was 18-year-old Canadian Denis Shapovalov, who climbed 76 places to 67th after reaching the semifinals in Montreal, beating world No. 2 Rafael Nadal along the way. Briton Andy Murray retained the No.1 spot but will lose it to either Spain's Nadal or Federer at the end of the week. Murray is injured and will sit out the Cincinnati Masters, where he reached the final last year. Meanwhile, Elina Svitolina and Caroline Wozniacki both moved up a place in the WTA rankings released on Monday after reaching the final of the Rogers Cup in Toronto. Ukraine's Svitolina, who won her fifth title on Sunday from five finals this season, is now fourth, one place ahead of Denmark's Wozniacki, who lost her sixth final in a row. Former world No. 1 Wozniacki did return to the top five for the first time since August 2015, though, with Wimbledon champion Garbine Muguruza dropping two places to sixth. Czech Karolina Pliskova held onto the world No.1 spot ahead of this week's Cincinnati tournament, which she won last year. The 20-year-old Zverev, the winner last week in Washington, DC, matched Federer with a fifth tournament title this year, although two of Federer's triumphs were at majors. He also stopped Federer's win streak at 16. He will try to keep it going at an event in Cincinnati. "It's something amazing, back-to-back weeks," said Zverev, who handed Federer only his third loss of the year. "I feel great. "I feel like I'm playing some of the best tennis of my life. But Cincinnati is a very tough draw. I don't know if I will be able to go far there because I am a little bit tired. But game-wise and confidence-wise, I'm super happy the way everything is standing." He avenged a loss to Federer at Halle, Germany, on June 25 and evened their career head-to-head record at two wins apiece. The fourth-seeded Zverev won US$894,585 while the second-seeded Federer got US$438,635. In Toronto, Ukrainian Svitolina capped a remarkable week by beating Dane Wozniacki 6-4, 6-0 at the Rogers Cup on Sunday to capture her tour-leading fifth title of the season. Fifth seed Svitolina, whose run to the final included wins over Venus Williams, Muguruza and defending champion Simona Halep, used a strong return game throughout the 77-minute match to beat sixth seed Wozniacki. "It was an incredible week. Played against great players, I beat them, and it's just something really amazing and I am very, very tired," said Svitolina, who was playing her third match in two days after rain pushed her quarterfinal to Saturday. "I left everything out there. It's been incredible that I could go through this. I didn't even think that I could."